Readers of this blog who don't have Twitter may probably think I am elated after "captaining Aguero" in Gameweek 22. Alas, I made a last minute captain switch and gave the armband to Payet. That futile move cost me 10+ points and l ended up with my first red arrow since Gameweek 18. On the plus side, I didn't tumble down too much in the overall rankings. But in all honesty, I can't afford to make such moves again this season. Also, it was a shame that I bought Oxford instead of Targett as my £3.7M make weight defender for Aguero. On a more positive note, I am now ranked 159th in Play Togga's Perfect XI. C'est la vie. 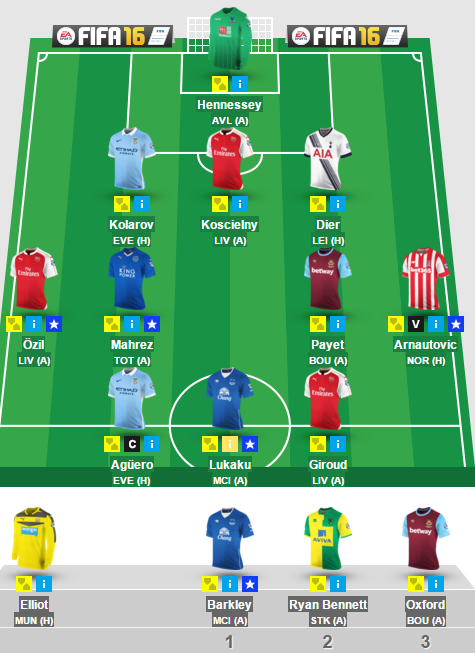 Looking to Gameweek 23,it made sense for me to get rid of Kolarov. He cost me 5 points with his injury and has become a rotation risk. I wanted to buy a low-owned attack-minded defender with some proven pedigree, complemented with some short-term form and a good run of upcoming games. Not too much to ask for, surely? Surprisingly, Leighton Baines checked all the boxes. In seasons gone, he was valued as high as £7.8M. I got him for a cut price £6.1M. Granted, he may not take penalties anymore, but he can still certainly take a mean free kick, a clinical corner and chip in with a deft cross. I am fully aware that the purchase of Baines ensures that I have three Evertonians in my team. That has some worry attached to it due to their off-ish form of late. I genuinely believe that they aren't a mid-table team and are due a good run of form. The return of Jagielka and Baines will give them much needed stability at the back. If Mahrez or Arnautovic blank again, I could very likely sell them. Also, I think my goal keepers have reached their shelf life and I will be looking to replace either of them. My captain for Gameweek 23 comes with a bit of added risk. Everton scored 3 at Stamford Bridge, yet Lukaku didn't assist or score. I think he is capable of doing so against a transitional Swansea team. Aguero as a captain choice also interests me but Everton have only conceded two goals at home since Gameweek 12. That certainly should give all FPL managers food for thought. On a final note, there is only a gap of 3 days between Gameweek 24 and Gameweek 25. Another captain fail, yet another green arrow. I have to say that I've been mildly lucky of late. The Payet purchase for Gameweek 21 certainly vindicated the hit and Giroud's brace was a bonus. Having said that, Kolarov's no show and Bennett's subsequent -1 added to lost points. In addition, I kind of feel that the failure of the "Template Team" for two consecutive Gameweeks has been a lost opportunity for me. Granted, my team has risen 200k over the last 4 Gameweeks. But my failure to take a bigger risk against convention and primarily use "shield" tactics has led to slower than desired progress. Looking at Gameweek 22, I wanted to sell Kolarov. Sagna seemed like the straight forward replacement. But it seems like City have a full back rotation nightmare on their hands with Kolarov v Clichy and Sagna v Zabaleta to the dismay of FPL managers. I am happy to give Kolarov one final chance and let Bennett auto sub on should the Serbian do another no show. Azpilicueta and Baines seem like the probably replacements that I am considering. 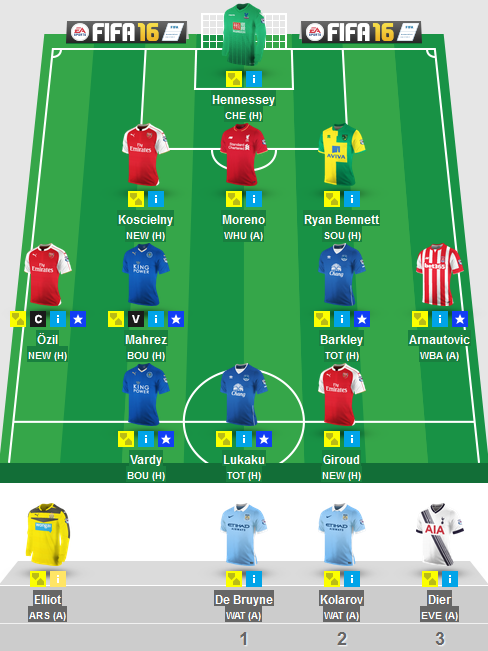 In any case, I would welcome 2 FTs for Gameweek 23 if it means that I can also offload Barkley or Mahrez. I was toying with the idea of captaining Payet for this Gameweek. 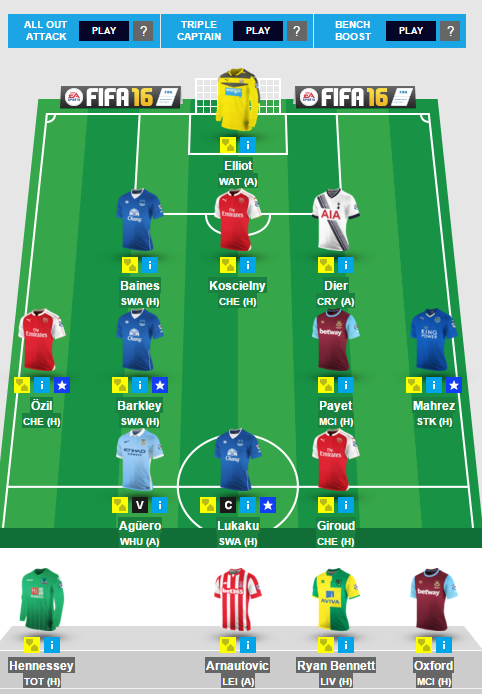 However, I have opted for Aguero (again). City rarely go goalless at home. The bore score draw v Everton was their first 0-0 in the Premier League since 2010. They face a Crystal Palace team that has lacked form and fitness in recent weeks. I am happy to let Aguero and his armband have a bite or two at them. Good luck to you all! Howdy. Had a good break? With 20 Gameweeks fried in the pan we have the passed the half way point - yet in many ways the season has only begun! It's safe to say that FPL 15/16 has been the most challenging in living memory. Who would have imagined Vardy scoring so much and Hazard scoring naught? 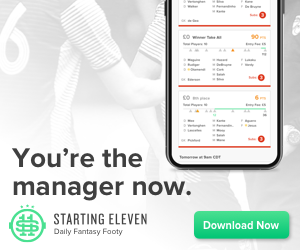 With many of the big teams and elite players misfiring, a lot of seasoned FPL managers have been caught off guard via the variance in play while the casuals bask in glory. Chips only complicate things and with many already burnt out there's hope for us all. 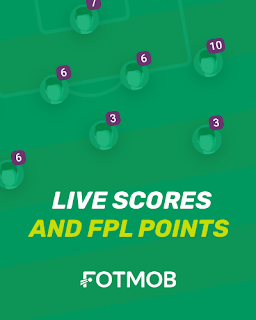 The festive fixture rush proved to be moderately successful for my FPL team - 163 points banked, 2 green arrows and a 130k rise. This was probably my best festive performance in 3 years. Having said that, I haven't been ranked this low (867k) at the Gameweek 20 stage since 2008. There's no denying that if you want to shoot up the rankings you need to think differently and smash those (tem)plates! With the January wildcard being replaced by one that only works in the second half of the season, I think it's premature to wildcard now (consider 2FTs and a -4 mini-wildcard) when you have those plum Double Gameweeks due to pop up in Spring time. So be patient. Keep your chips for that time too, but I would strongly recommend using the all out attack chip during a truncated/shortened Gameweek - the League Cup final weekend (GW 27) fits the bill perfectly as 2 Premier League teams will compete in the final which means that 4 teams won't be in action for GW 27, thus you could make do with 2 defenders and invest further up the field if needed. Looking at this week, I decided to act fast and make my Gameweek transfers earlier than usual due to a number of expected price rises and falls. I opted to sell Vardy due to doubts over his fitness and form. I think the Leicester mirage is gradually unravelling and it was time to look at a quality replacement - cue Aguero - He is fully fit and his recent competitive form is spot on. He costs £13m+ but is worth it due to his short term prowess, long-term pedigree and City's run of upcoming games. I also wanted to buy Payet. He hasn't scored or assisted post-injury but I am willing to take a punt on him before his ownership shoots up - de Bruyne was the fall guy. Why? His away form has been dire and I'm worried that he could be muscled out by Silva, Yaya and Aguero. 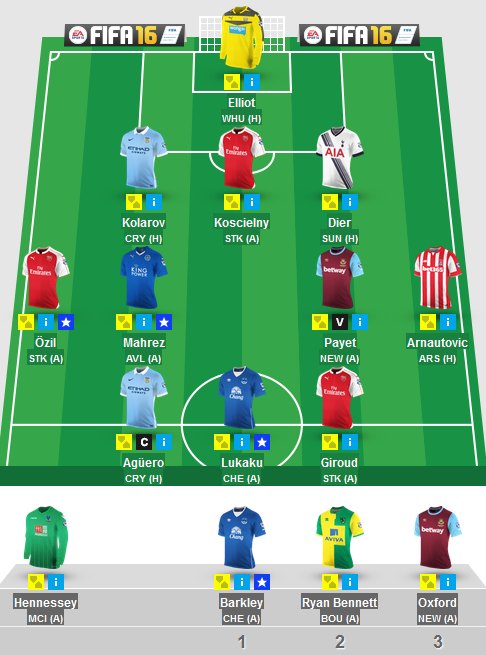 Besides I have Kolarov and Aguero. Finally, with the end of the festive period I wanted a "dud sub 3". I decided to sell Moreno due to his poor displays of late and harder run of upcoming games. I could only spend £3.7m on a replacement and Oxford fitted the bill. Looking beyond this Gameweek, I think it's hard to ignore Chelsea cover. I am looking at Costa/Alli in for Giroud/Barkley as a potential future swap. In addition, I would try and somehow get Sanchez when he is fully up to speed. Aside from that, chin up and don't forget... we can be heroes, (even it's) just for one day. *Sorry for the lack of comment on my team's changes during the festive period. Normal service will hopefully resume from Gameweek 21.